Dr. Alexander Tomilin – is heading the “Operational Systems” department at the Institute of System Programming, Russian Academy of Sciences. He is also a professor of the chair “Automatic Systems and Computation Complexes” at the faculty “Computation Mathematics and Cybernetics” of the Moscow State University. A.N. Tomilin has been awarded an honourable title “Distinguished Scientist”. Dr. A.N. Tomilin graduated form the department of Mechanics and Mathematics, Moscow State University in 1956. He submitted his thesis for the “Candidate of sciences” degree in 1969, and the thesis for the “Doctor of Sciences” degree in 1990. The subject of his doctoral dissertation was “Operational means for working out and control in real time information processing systems”. His university career Tomilin started in the 1960-s as junior lecturer at the chair “Computer Engineering” of the Moscow Institute of Physics and Technology ( http://phystech.edu/ ). The chair itself had been established at the Institute of Precession Mechanics and Computer Engineering, which was headed by the leader of soviet computer science Sergey Lebedev from 1951 till 1974. He has also been teaching various programming related subjects at the popular faculty “Computation Mathematics and Cybernetics” of the Moscow State University (MSU) since its foundation. In 1990 A .N. Tomilin was awarded MSU professorship. 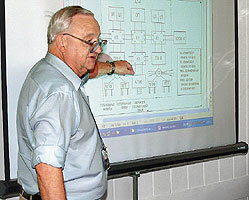 Now he is one of the leading lecturers there; his total teaching experience counts more than 40 years. Dr. A.N. Tomilin authored and introduced basic courses for core curriculum, mainly on computation and operating systems, and special courses on organization of computation processes. Now he presents his new courses “Computation systems” and “Operating systems of multi-machine complexes”. He has been advising diploma and post graduate projects. Seven his post-graduates successfully submitted their theses and obtained scientific degrees. His solid scientific reputation A.N. Tomilin deserved during participation in design works on the most famous soviet computer BESM-6, under S. Lebedev . He took part in creating its architecture and working out its operating systems. After that he worked for another (even more powerful) computer complex AS-6 which was in use at the control centre of the space researches, and also for the super-computer “Electronica SS-BIS”. In 1969 Dr. A.N. Tomilin was awarded USSR State Premium. In 2002 his series of research works “Modelling of computation structures” was awarded “S.A. Lebedev premium”. Dr. A.N. Tomilin also essentially contributes to organisational work. He is a member of the academic councils for scientific degrees conferment, a member of the expert councils of the Higher (scientific) Certification Commission and the Russian Fund of Fundamental Researches. He actively participates in preparation and conducting Russian national and international congresses and conferences.